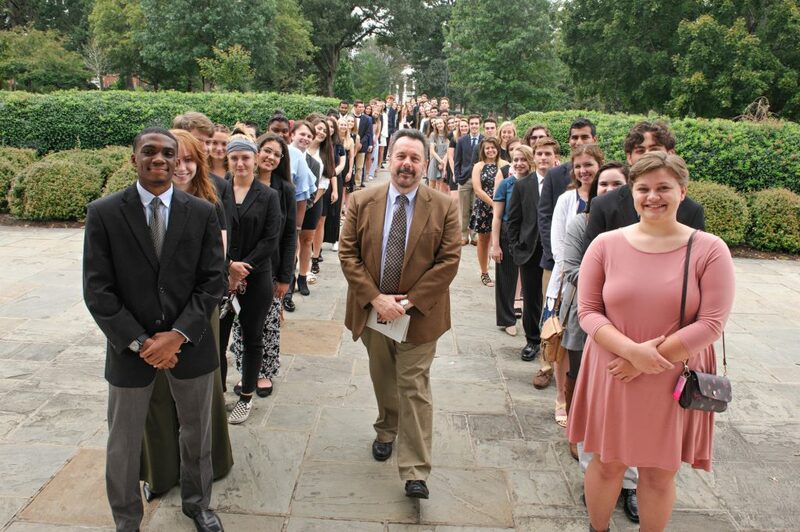 Seventy University of Lynchburg students were inducted into the Society of Westover Fellows on Sunday, September 30, during at standing-room-only ceremony at Snidow Chapel. There were 65 first-year students and five sophomores inducted. “They are pursuing majors in all the Colleges of the University of Lynchburg and a large percentage of the students are varsity athletes,” he added. It has become a tradition at Lynchburg for new Westover fellows to provide a meaningful quote for the induction ceremony program. This year was no exception and the quotes, like the fellows, were diverse — in their sources, seriousness and subject matter. New Westover fellow Kobe Anderson ’22. View more photos from the ceremony on Flickr. 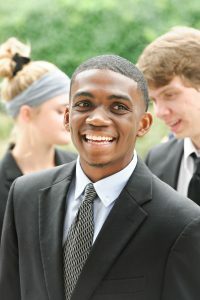 Kobe Anderson ’21, a math major from Baltimore, Maryland, quoted civil rights leader Martin Luther King Jr.: “If a man hasn’t discovered something to die for, he isn’t fit to live.” Anna Kueng ’22, an English major from Danville, Virginia, submitted, “I would always rather be happy than dignified,” quoting the title character of Charlotte Bronte’s Jane Eyre. Dr. Sally Selden, Lynchburg’s provost, said she was impressed by the “energy and intellectual curiosity” of the 2018 inductees and called this year’s class “one of the most diverse and talented group of fellows” in the 31-year history of Westover Honors. During the ceremony, Endasia Mitchell ’19, president of the Westover Honors Executive Board, spoke about perseverance. A track athlete at her Maryland high school, Mitchell said one of the reasons she came to University of Lynchburg was to run track. When she was sidelined with injuries her freshman year, however, she almost gave up. Mitchell admitted to going through other struggles with Westover’s rigorous academics and with paying for college, but again, she worked hard and persevered. She encouraged her fellow Westovers to do the same, but also to reach out to each other. The 2018 Westover inductees with Dr. Ed DeClair, dean of the Westover Honors College, at center. View more photos from the ceremony on Flickr. “Some of you may realize you are alone in some fight,” Mitchell, a double major in criminology and Spanish, said. “Whether that is the fight to be a college student, an athlete, the fight to keep your family together, the fight to help a friend. It’s a scary thought, but that does not mean to give up or to confer to the majority. This only means to fight harder. Hannah Belayachi, one of the new inductees, also addressed the crowd. Belayachi, a Centreville, Virginia, resident and communication studies major, talked about her experiences as a Westover Fellow thus far. Speaking about the two-day retreat for new Westover fellows, held each August before the start of classes, Belayachi said some of her preconceived notions about the program were challenged. “I knew no one coming into school and was fearful that the honors college would be filled with serious students who valued academics and only academics,” she said, adding, “I soon learned how wrong I had been, and I wouldn’t have even tried to know if Westover did not have the annual retreat.